to quickly find what they came looking for. Turns out, search engines want this for our visitors as well, and they’ve become increasingly good at determining how well our content serves our audiences. Additionally, the organization of our web pages has a very direct impact on how search engines find, index and rank our content. 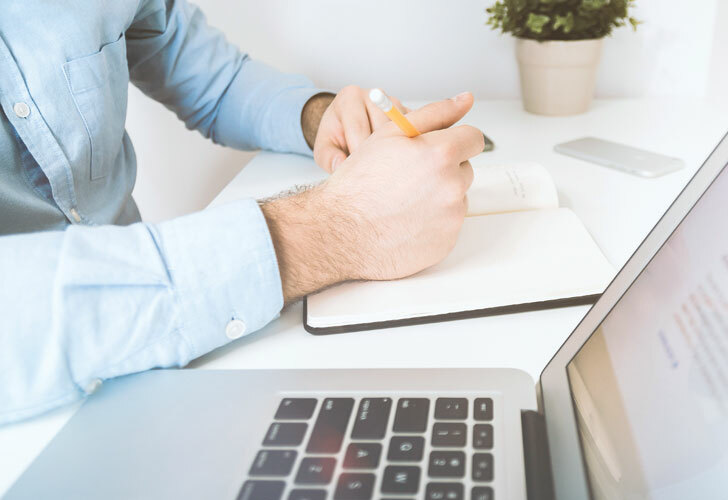 If you’re in the early stages of planning a new website, this is an ideal time to take the steps necessary to create an organized, intuitive, and efficient website structure; one that will enhance your SEO efforts, not hinder them. Regardless of where you’re at in the process, you should have a really good idea of how to organize a website to serve both users and search engines by the end of this 6-step post. Sounds simple, but don’t just rush through it, because it’s important! Are there specific industries you target? Are there specific geographies you serve? How do people use your products/services? As you’ll see in later steps, there may be opportunities to target specific aspects of your business outside of your core product or service offerings. In fact, some of your best results may even come from them. A friend of mine developed a rubber board stand that people can use to display their surfboards in their home. While his original intent for the product was to display surfboards, it works equally well for displaying skateboards, snowboards, wakeboards and a few other ‘boards’. This is going to open up a lot of extra opportunities for him in the coming steps. separate searchers for Mac and Windows (both of which they service). Similar to the board stand example, these insights led to big opportunities in the later steps which we would not have had without going through this process. Start by jotting down some “seed” keywords. These are the broad, top-level terms that represent your core business offerings and are usually 2 – 3 word phrases. 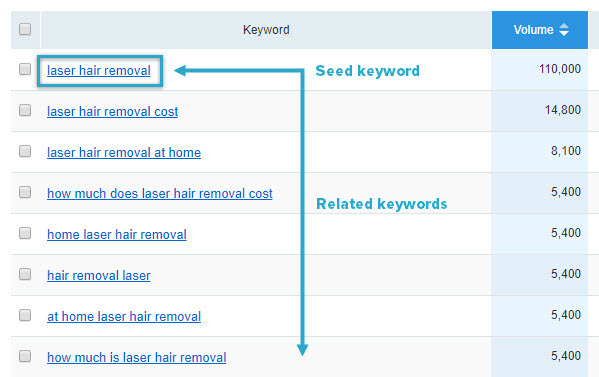 Next, use one or more keyword research tools to generate additional ideas based off actual terms being typed into Google (SEMrush is my keyword research tool of choice). scan and remove terms I know I don’t want. I’ll do this for a handful of seed keywords, combining each exported list into one master document. The columns I keep are: Keyword, Search Volume, Keyword Difficulty (optional, but if your tool has this, go ahead and keep it). Next, I’ll start grouping the keywords into topic categories. For example, “laser hair removal” and related terms would be one group, and “acne treatment” and related terms would be another. Once I have most of the big categories figured out, I’ll run a few more seed keywords from each topic category into SEMrush to make sure I’m not missing anything. Regardless of how much time and energy you put into step 2, there will always be golden keyword opportunities you’ll miss during your first round of research. One of the best ways to uncover these opportunities is by seeing what keywords are driving traffic to competitor websites. To find these competitors, simply type a few of your top priority search terms into Google and pull out a few of the pages that seem similar to yours. Then, enter their root domain (e.g. domain.com) into SEMrush and click “Start Now”. Scroll down to “Top Organic Keywords” and click the “View full report” button. With the free version, you’ll be able to see the top 10 keywords driving traffic to that domain. The default view is sorted by Traffic % – meaning, terms driving the most traffic to that domain to the least. If you’re using the free version, you can sort by the other columns to see some additional terms. After you’ve had some fun with that, click on the “Pages” link from the left-side navigation. This will show you the top 10 traffic receiving pages on that domain (i.e. the specific web pages on the site that receive the most traffic from organic search results). 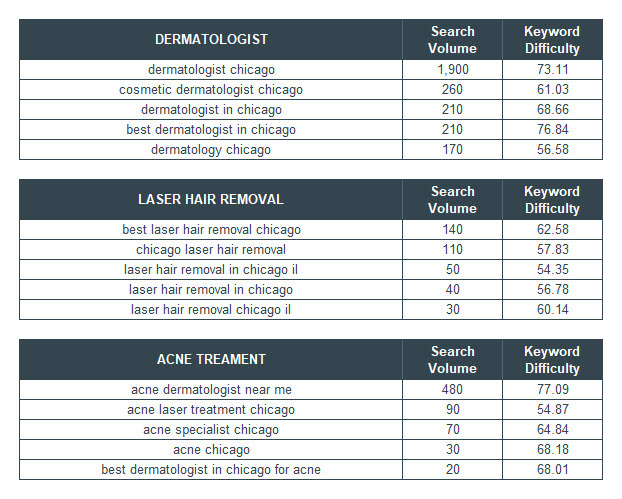 From there you can click on each individual page to see the top search terms driving traffic to each. 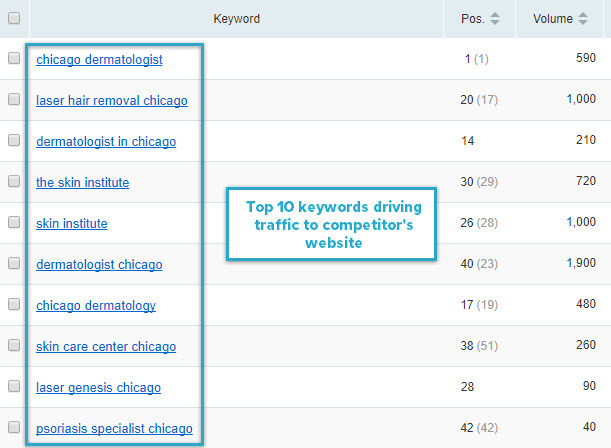 Are there any keywords/topics driving traffic to a competitor’s site that I missed during my initial keyword research? Do those keywords/topics make sense for my business? i.e. do they represent people searching for something I offer? Answering “yes” to both of these questions means you should probably plan on adding a page to target those terms. Each of the topics you create above will require a separate page on your website. 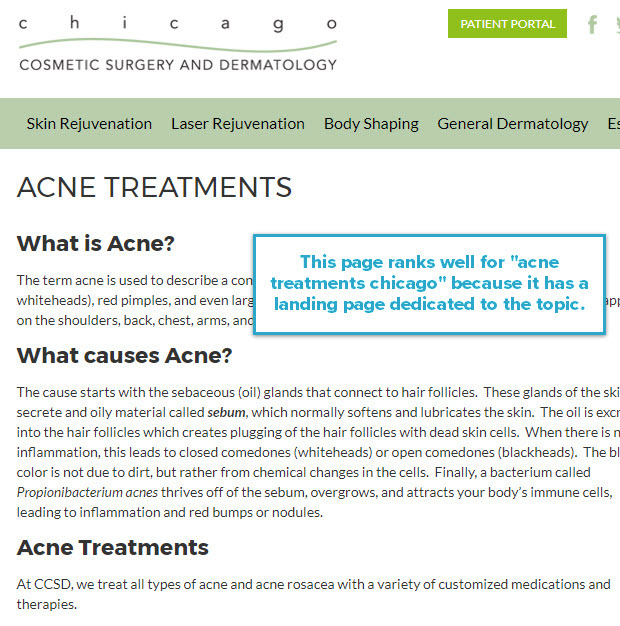 When someone searches for “acne treatment chicago”, what will be a better experience for them; landing on a page that’s dedicated to acne treatments with before/after pictures, patient testimonials, etc., or landing on a “What We Do” page with broad explanations of a dozen different services? The former will be the best experience for the prospective patient, which also happens to be what Google wants and has gotten very good at rewarding in search results. What if I have two closely related, but technically different keywords; should I target them on one page or two separate pages? This can be tricky, but luckily we can turn to Google for help. Simply search each keyword in Google and compare the first page of results. Are a lot of the same web pages ranking in both results? If so: the intent for each term is similar enough that you can target them both on one page. If not: the intent for each term is different enough that you should target them on two separate pages (i.e. one page for each term). These words seem similar, but I’m wondering if they should be targeted on one page or two. A quick comparison of the search engine results page (SERP) for these two search terms reveals that there is a large overlap in pages ranking in both the organic listings and the local listings. As such, I should be able to target both terms on one page. This is where you determine where and how these pages will fit together on your website. The goal is to make it as easy as possible for both web crawlers and users to browser your website and understand what the various sections and pages are about. Think of your website as a pyramid. Your homepage is the top of the pyramid, your main category pages are the second level, and relevant subcategory pages are the third level. If you need more than 4 levels, rethink the levels above! Your main category pages should appear in your main navigation (i.e. always visible in the header of your website) and should represent the main topic areas of your business. Subcategories, if/when necessary, should fit logically under main categories (i.e. as “subsets” of the topics). Try to keep your main categories to 7 or less and the number of subcategory pages somewhat even across main categories. 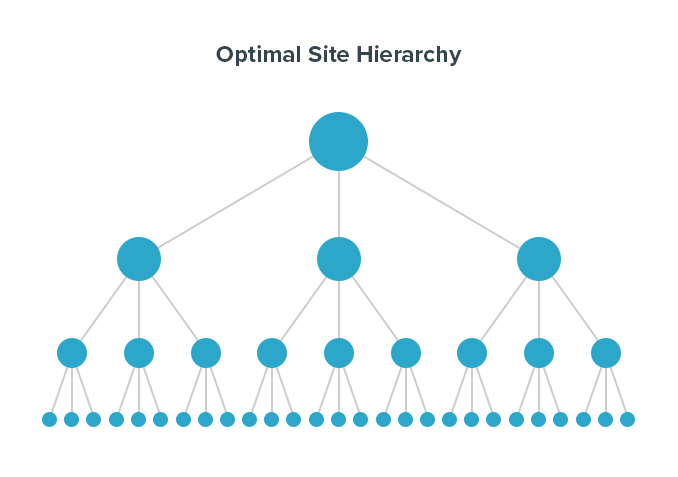 Match your url structure to your page hierarchy. Like your page hierarchy, your URL structure should be simple and intuitive. URLs should be: short and descriptive, use hyphens (not underscores) between words, and void of unnecessary/excessive parameters. Each level of the pyramid should ideally reside in its own directory, following the level/directory above it. 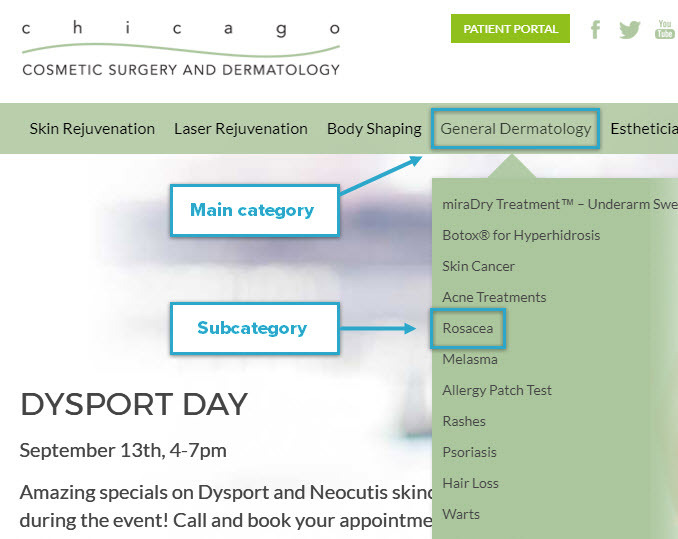 This makes it easy for me to understand that the above page is all about Rosacea, which is one of their General Dermatology services. 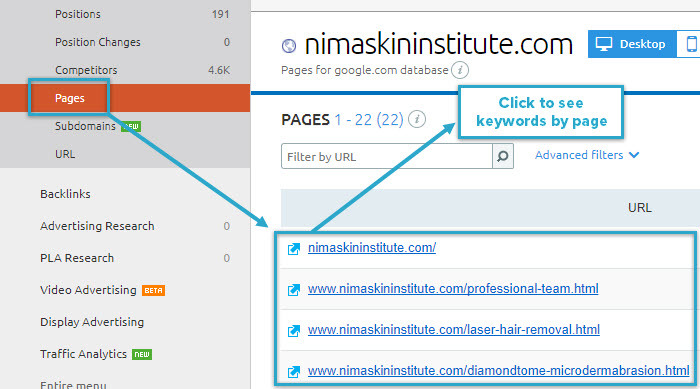 Internal links refer to links from one page of your website to another. They are used to help guide web crawlers and site visitors to additional, relevant information across your domain. improve metrics like ‘time on site’, ‘pages per visit’ and ‘bounce rate’. When linking from one page to another, be deliberate about the words and phrases you use as the hyperlink (known as anchor text). In most cases, the anchor text should be descriptive and relevant to the page you’re linking to, as opposed to general phrases like “click here” or “read more”. Here are my best SEO tips for a new website. For my best SEO tips for a new website, click here. Use Google to find internal linking opportunities. Search site:yourdomain.com keyword where keyword would be a key phrase that represents the linking page. 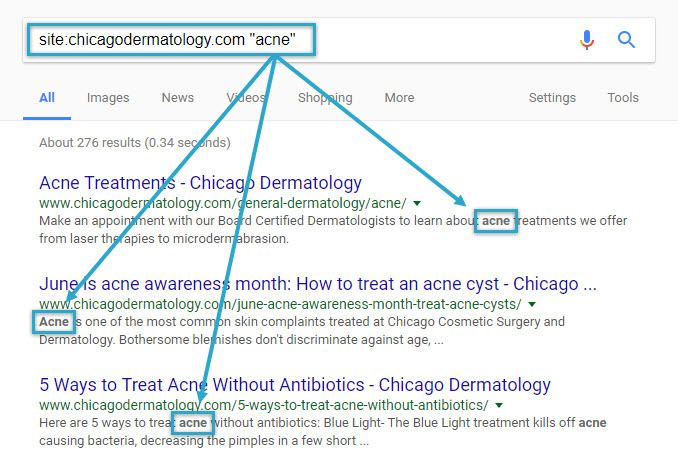 Google will return a list of pages on your domain in order of most to least relevant to that term. Additionally, you can put “keyword” in quotes to return pages that mention that keyword, verbatim. What types of challenges do you face? I did my best to outline a straightforward process for organizing a website that any business could follow. That said, I know there are extra challenges and considerations for certain types of websites and/or business scenarios. If you have a specific question or challenge you’re facing with how to organize a website, I’ll be more than happy to help in the comments section below.